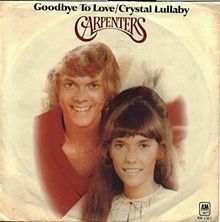 Одна из лучших песен дуэта Carpenters из альбома "A Song For You" (1972), авторы - Bettis/Carpenter. I'd say goodbye to love. And to live for something I could live for. I'll go on as best I can.